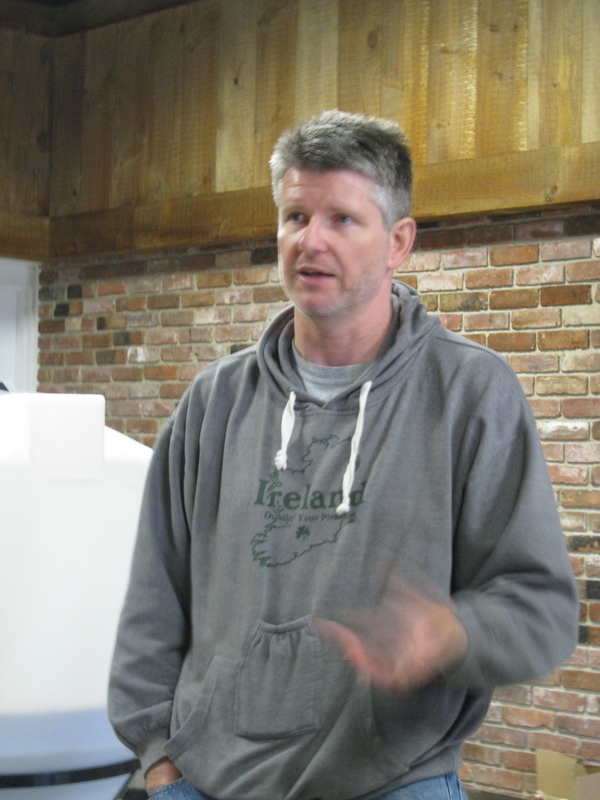 Rich Visco of Shebeen Brewing of Wolcott, Conn. The statement is something you’d expect from a clown or string collector, not necessarily from a brewer, known for their exacting demands for consistency and efficiency. But coming from Rich Visco, who’s been tinkering with recipes for beers like coffee bacon stout and a canolli beer, it makes sense. Just in time for St. Patrick’s Day, I bring you a profile of Visco’s Irish-themed Shebeen Brewery, to open in Wolcott, Conn., in May. The Northern Ireland-born owner and head brewer has grand plans for Shebeen –an Irish word meaning an illegal drinking establishment — and has been aggressively getting the space ready since moving in last December. His first smart choice appears to be his landlord: John Sullivan of Sullivan Brothers Remodeling. Shebeen is using converted space connected to the furniture store that used to be a machinist’s shop. It turns out that the companies will benefit one another: Sullivan will keep a window between the businesses so that beer drinkers in the tasting will see his showroom and furniture buyers will see people enjoying beers over a bar Sullivan built. “It turns out to be a good partnership,” Visco said during a quick tour of his three-room headquarters. It’s quick because Visco, a broad-shouldered man with salt-and-pepper hair, pinballed back and forth investigating a leak here, meeting with an investor there. When I did my walk-through, the space was pretty bare — still all painted brick and concrete. Outside, Visco’s had a deck installed for outside tastings; he’ll also be installing a 14-by-10-foot sign out front to tempt passers by. The operation is still small. It has a one-barrel system, which churns out about only two-and-a-half kegs. Visco will expand to a 15-barrel system and keep the one-barrel for research and development. That includes some gems. 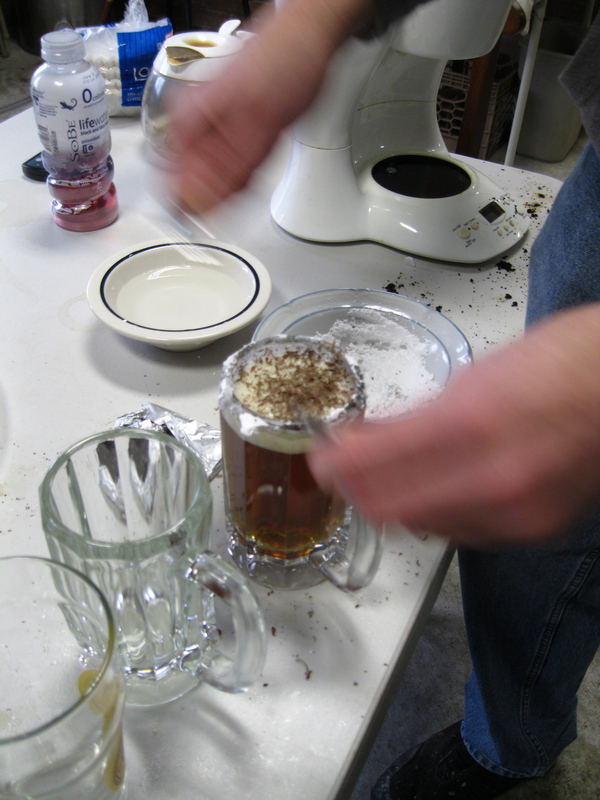 There’s the Bacon Kona, which includes coffee and crispy bacon that’s added in a mesh bag toward the end of the brew for aroma. There’s also an Idaho IPA, which uses hops that come exclusively from the Gem State, as well as Betty Crocker instant potatoes. Visco said these experiments won’t be the big sellers; he’s got a more traditional West Coast IPA for that. “I like to confuse,” he said. I tried his Concord Grape Saison, a thick brew redolent of the dark fruit. While we sipped the high-alcohol beer, he told me the story behind it. “It was during Hurricane Irene, and I went to secure my boat,” he said, referring to his vessel on a lake in Marlborough, Conn.
Pat Lacerra of Yonkers is one of Visco’s two partners; he represents the Italian side of the brewery, and Irish and Italian flags over a vat in the brew room honors the partners’ heritages. “I’d always wanted to start a business from the ground up,” Lacerra said. While drinking a canolli beer (an ale topped with powdered sugar and shaved dark chocolate), Visco put his weirdness in musical terms. Clearly, Shebeen is finding its voice, and Connecticut could be very lucky to hear just what comes out.